Impact investors are buying into social enterprises through community bonds. Some of those investors want to put their community bonds into their RRSP accounts. We investigated why mainstream financial institutions usually hesitate to accept community bonds into their clients’ RRSP accounts. Our interviews revealed key barriers that render the bonds expensive and difficult to process relative to the retail investor’s average purchase. The barriers likely outweigh the benefits of RRSP access for retail investors. 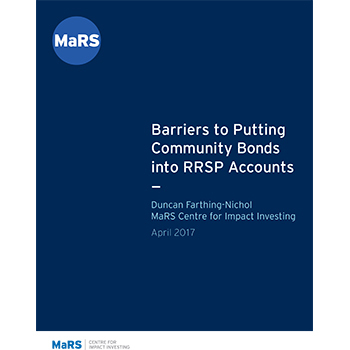 We suggest that the growing community bond market look outside mainstream RRSP accounts as it seeks strategies to expand.